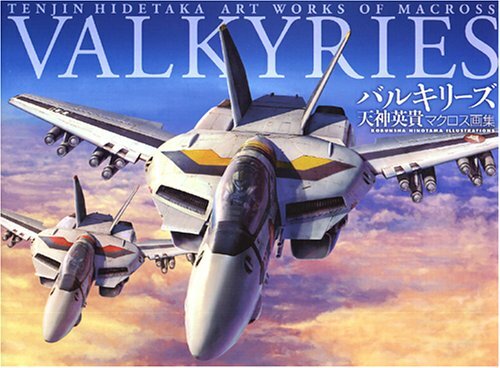 Here's バルキリーズ 天神英貴マクロス画集 or Tenjin Hidetaka Art Works of Macross Valkyries. The illustrations contained within are actually art for the model kit boxes. These planes come from the various Macross anime series, namely Macross Do You Remember Love, Macross Zero, The Super Dimension Fortress Macross and Macross Plus. This is one art book where I really wanted to take pictures of every illustrations in it. They are stunningly beautiful. The metal blemishes on the planes make them look so authentic you almost believe they are real. There is a nice variety of planes included. I won't go into the different models but the plane designs are just wonderful to look at. There are very few pieces of the transformed robots though. And all the illustrations are captioned. My favourite piece is one of the VF-0S plane with the wings and booster almost in shreds at the ends. How the hell did that plane get flown into that condition?! At the end is an interview with Tenjin Hidetaka, in Japanese. There's also a work-in-process look at how the planes are constructed. I see construction lines but I believe the some planes should be digitally painted over 3D models. Unless I'm mistaken, in which case, I will be even more impressed with the illustrations. This is a very highly recommended art book if you're into planes. It's one that you can't stop flipping until the very last page, for each time you pick up to read. Hi and thanks for this review. Is this a hardcover book or do you know if there is/was a hardcover version? Cheers! This is a paperback version with dust jacket. I don't think there's any hardcover version. Thanks for the support. Hope that you'll enjoy the book.